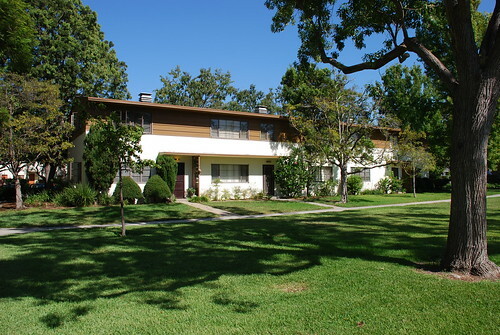 The park-like, planned community of Village Green in Baldwin Hills is one of the hidden sanctuaries of the city of Los Angeles. You’d think, though, that a chunk of land nearly seventy acres huge wouldn’t be such a secret, but my guess is this is the way the Green’s home owners like it. 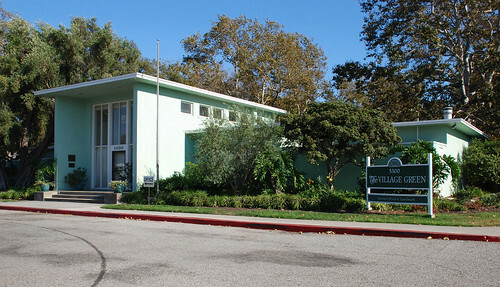 With Sunnyside Gardens in Long Island City, New Jersey’s Radburn, and Greenbelt in Maryland, the planned communities movement in the United States had been around for about a decade by the time preparations began on the L.A. version. 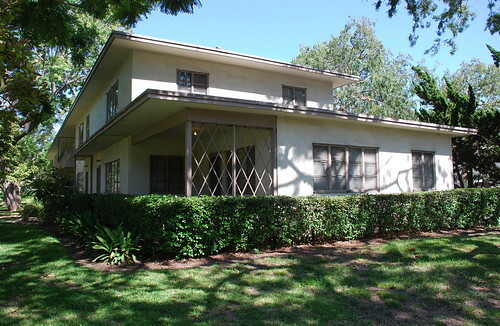 Planners chose a site – on land owned by Lucky Baldwin – as early as 1934. Baldwin had bought the land back in the 1870s. 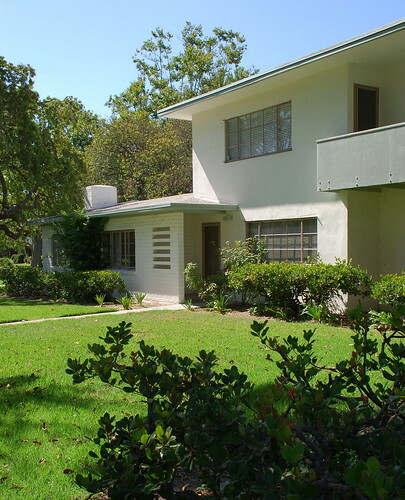 In 1938, a group of L.A. architects – Lewis Wilson, Edwin Merrill, Robert E. Alexander, and led by principal architect Reginald D. Johnson (whom we met at HCM Nos 32 and 66) – began to cobble together the various approvals, loans, and insurances needed to go forward with the project. (For starters, the city had to annex the site.) Clarence S. Stein, who had worked on the Sunnyside, Radburn, and Greenbelt projects, acted as consultant. 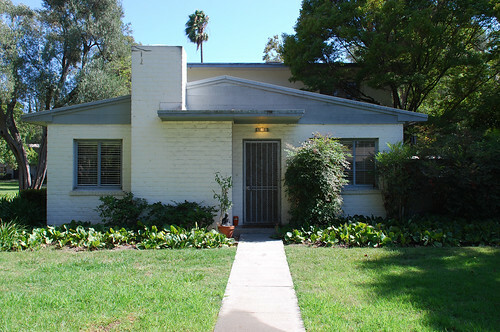 When the group got its ducks in a row in February 1941, construction began on the east side, on Sycamore, and moved west. The several years of planning gave the architects the opportunity to come up with around fifty different plot plans. The ultimate plan called for a street-free “super-block” spread out over an undivided sixty-eight acres, twenty of which were to be devoted to several large greens and lots of garden courts. 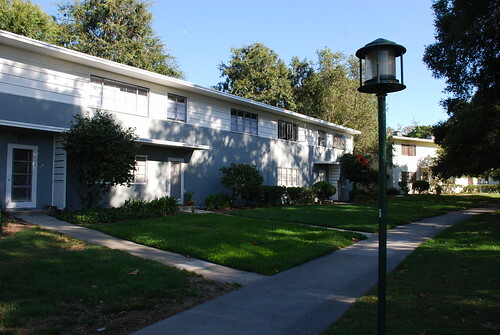 Ninety-five buildings containing 629 rental units were built using sixteen different floor plans. 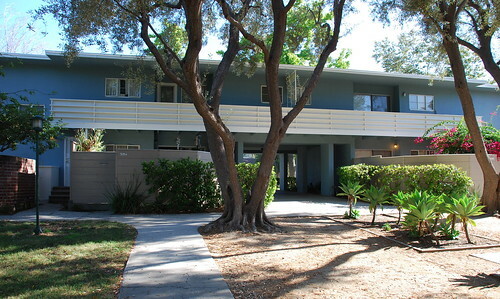 450 of the apartments had private patios, most of which were enclosed by six-foot walls. 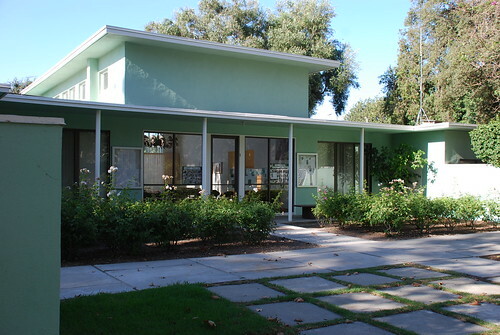 The buildings, all one- and two-stories, were painted with light pastels, including cream, salmon, light green, apricot, and aquamarine. 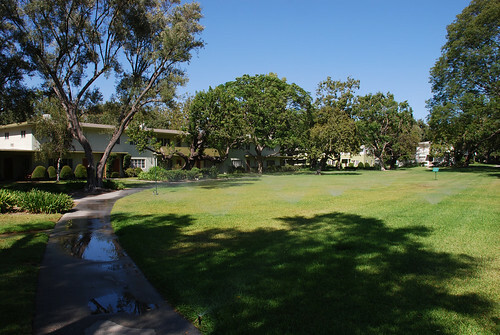 As then, each unit today faces one of the greens or a garden court. 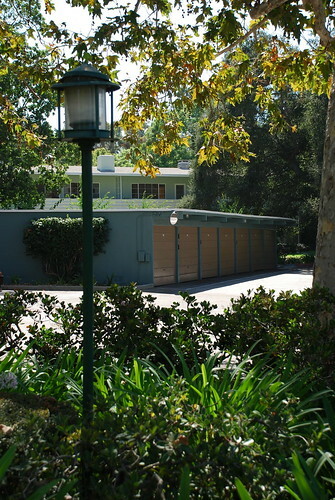 The access roads, garages, and parking are all located around the landmark’s perimeter. 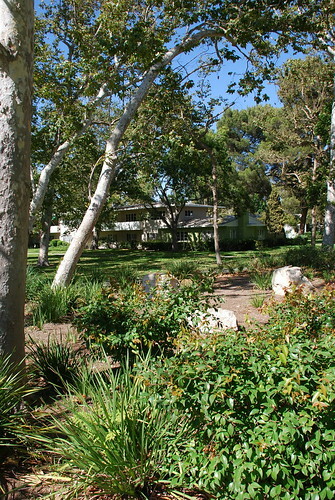 Included originally were a pair of playgrounds, a pool, tennis and badminton courts, even horseshoe pits. 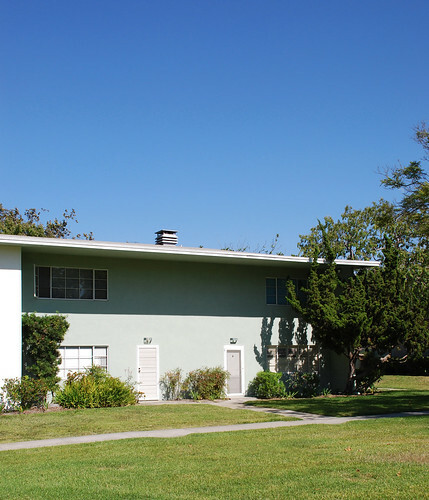 The first residents, mostly middle-class, moved into what was then named Baldwin Hills Village on December 7, 1941 (I knew I heard that date before), ten months before work was more or less completed. 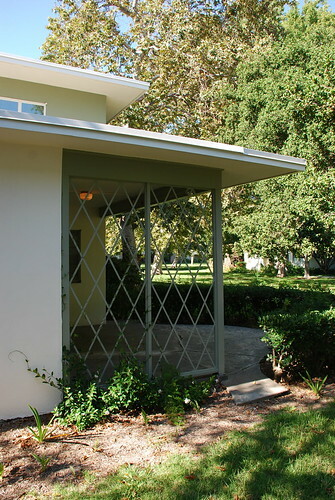 I say ‘more or less’ because, among those moving into the new community were architects Johnson, Alexander, Wilson, Merrill, and the site’s landscape architect, Fred Barlow, Jr, who continued to make refinements to the community. 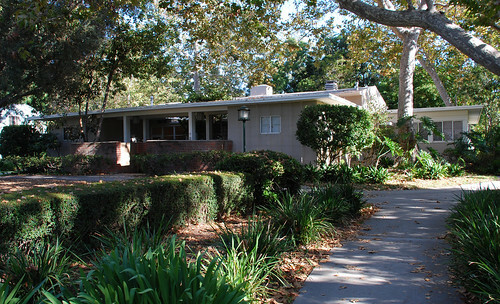 Below is the old clubhouse, originally intended to be a nursery school. 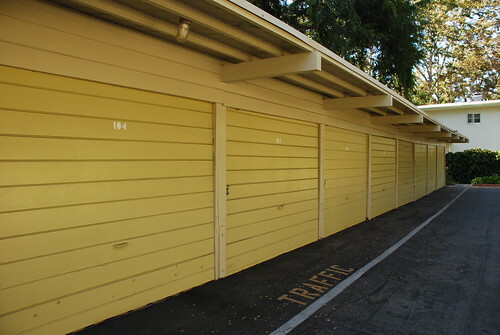 It had a rental library, darkroom, kitchen, pantries, and billiard and ping pong tables. 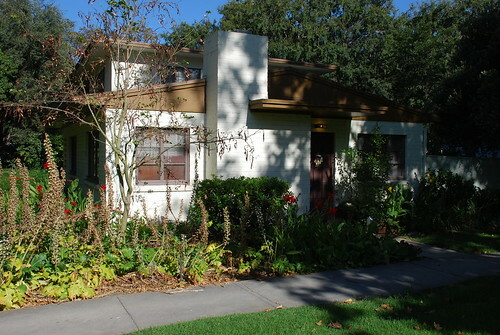 The building was converted to a pair of residences when new owners took over a few years after WWII. 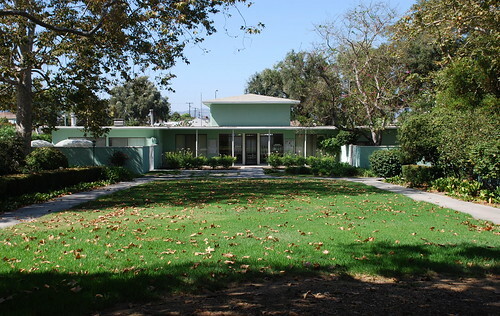 Here are four shots of the Green’s former administration building, now the clubhouse. 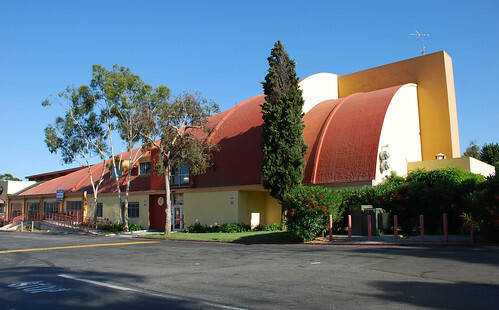 Not only did it hold various offices and the reception center, it was also home to a large Rico Lebrun mural. Wait. Actually, it still is home to a Rico Lebrun mural, only it’s been mournfully covered up (recovering the artwork will run into the hundreds of thousands of dollars – a replica hangs in place of it). 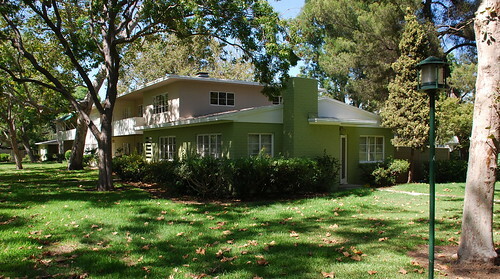 Just last year, the old administration building was restored to its original 1941 pastel green color you see here. 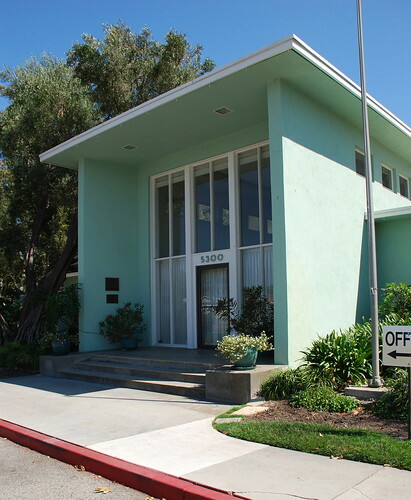 In 1949, the original investors sold Baldwin Hills Village to the New England Mutual Life Insurance Company of Boston. 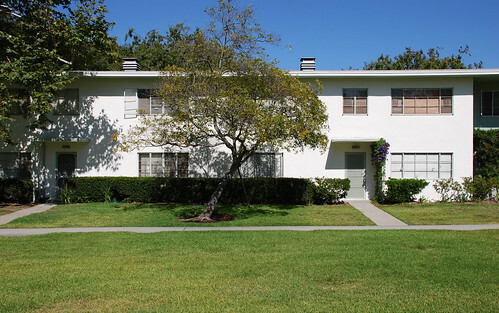 Sometime after that, Lucky Baldwin’s grandson, Baldwin M. Baldwin, bought back the complex. 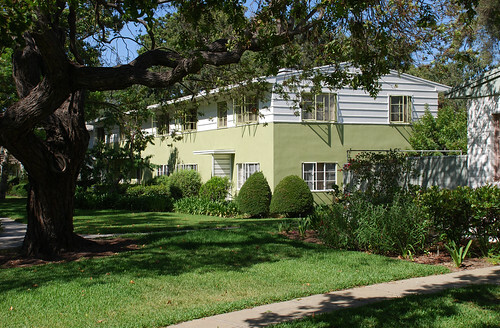 A year after his death in 1970, Terramics, Inc., purchased the property, converting it to condominiums from 1973 to 1978. 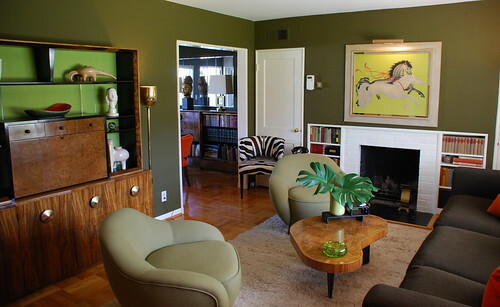 The condo conversion was initially overseen by original architect Robert Alexander. 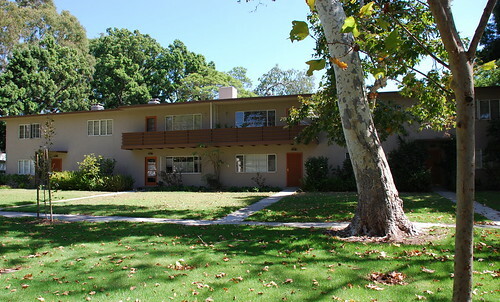 In 1972, the AIA awarded the Village Green its fourth-ever twenty-five-year National Award for Excellence, in recognition of architectural design of enduring significance. 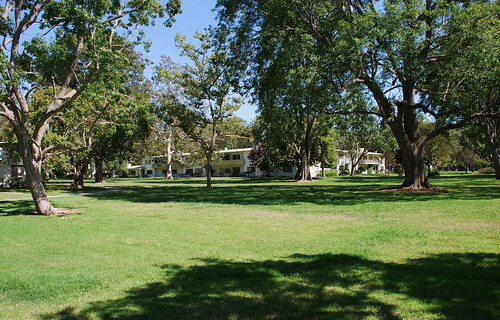 A city landmark in 1977, Village Green was made a National Historic Landmark in January 2001. 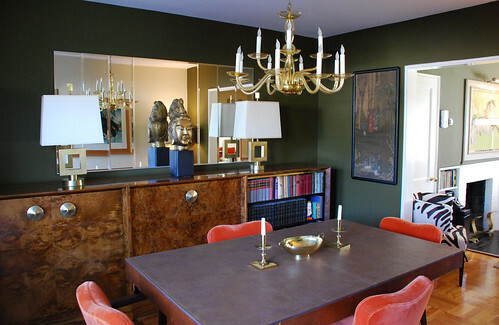 Finally, an interior - not from 1942, but from August, 2008. Nice, huh? A very, very big thanks goes to Mr Steven Keylon, Vice-President and Secretary of the Village Green Owners' Association, who not only took the time to welcome me to Village Green the other weekend, but also provided me with scads of research he’s been compiling for years. Village Green could not have a better, more passionate custodian than Steven. Want proof? Go see his more than 300 archival photos of the community by clicking right here. Thanks, Steven. I actually have a friend who lives in Village Green and we went down there to take some publicity photos for a bunch of comedians. I was blown away by the beauty of the place, not to mention its total "tucked-away" quality down there. Very cool place. And yes, that photo of the old theatre did break my heart. Good lord! Lucky Baldwin...who knew??? Thanks for posting that link. I agree with anonymous, your site is the one I look forward to most! It was great meeting you a few weeks ago. This post is great, and I love the pictures. We all feel so fortunate to live here in such a place! Again, Steven, thanks a ton for your hospitality, research, and passion for Village Green. And best of luck with the ongoing restoration (not that I can imagine it any more beautiful). Sure, Steven. Take whatever you need. Thanks for the interest.